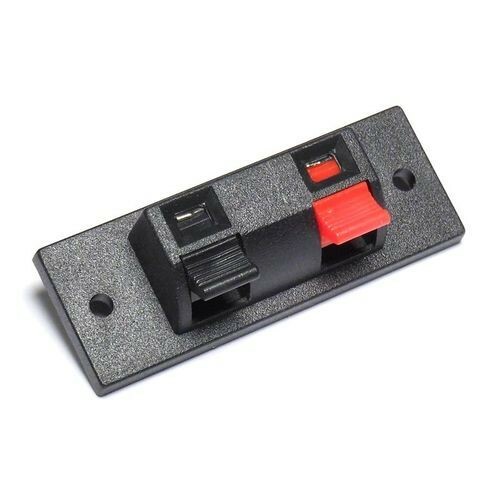 Push-button / spring lock two conductor speaker terminals for easy wire hook-up. Flush-fit for easy mounting, just drill 2 holes for the internal wires and the 2 screw holes to mount. Note: Terminal can be mounted behind a panel into a square hole that was 1.215" or 1-7/32" in length X 0.560" or 9/16" width, panel thickness must be less than 1/8" thick. Solder lug terminals fit up to 16 AWG wire. Works great with our speaker wire terminals; 121-1003, sold separately.